Celebrating 25 years of Expedition Cruising, luxury travel company Abercrombie & Kent has released its 2015 – 2016 brochure for polar expeditionary cruises. With more than 175 expeditions under its belt, A&K still sets the standard with innovation and leadership driving the design and delivery of each and every voyage. Crew and staff are still hired for their unparalleled experience in both the North and South Poles with each expedition team member having more than 18 years' experience on average and A&K's immaculate safety record speaks for itself. 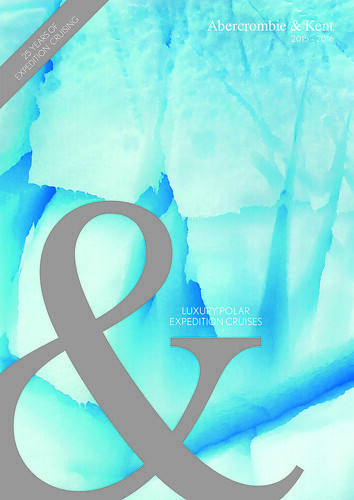 Created by on-the-ground experts, led by a remarkable expedition team of research scientists and naturalists and operated exclusively by A&K on board luxury cruiser MV 'Le Boreal' the voyages in this brochure reveal the polar reaches at their astonishing best. The elegant guest quarters aboard 'Le Boreal' are among the most spacious and comfortable on any Antarctic cruise with a choice of bedding configurations. She carries just 199 guests and each cabin has a private balcony. 'Le Boreal' has an ice rating which exceeds that required in the demanding polar conditions and is equipped with the latest navigation, communications and safety equipment. A technologically-advanced stabilising system minimises the effect of rough seas. A journey to Antarctica is one of the world's great adventures. It is an expedition to the harshest, driest and coldest region on the planet - the world's most remote and final frontier. There are four Antarctic expeditions on offer for the 2015-16 season. Each visits the wildlife rich Antarctic Peninsula with two adding South Georgia and the Falkland Islands. Journeys are themedwith a special family expedition over Christmas and New Year, a Climate Change mission trip plus two photographic journeys. A&K's 12 day 'Classic Antarctica' 9 – 20 December 2015 is priced from US $9,995 per person twin share for bookings made by 31 December 2014. On the other side of the world is a journey to the Great White North taking guests to Norway and the High Arctic Svalbard archipelago, less than1,000 kilometres from the North Pole. This expedition is a unique chance to contrast the fishing villages, hamlets and culture of the High Arctic with its fantastic abundance of wildlife. Observe the amazing flora that comes alive under the midnight sun and go in search of the mighty polar bear. Explore incredible fjords and remote settlements in Greenland plus glacial-carved terrain and volcanoes in Iceland. A&K's 15-day 'Arctic Cruise Adventure: Norway, Greenland & Iceland' 15 – 29 July 2015 is priced from US $12,995 per person twin share for bookings made by 31 October 2014.